September quarter GDP data is out from the ABS. 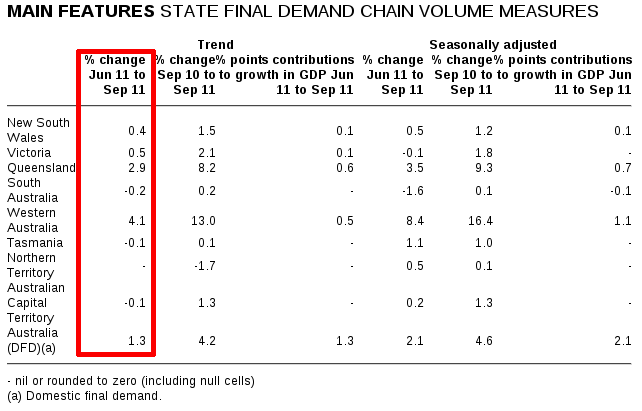 Prepare yourself for much trumpeting from all the usual suspects (Government, lamestream media, Labor supporters) about the headline figure – “strong” growth of 1% (“seasonally adjusted” ie, fiddled) in the September quarter, thus lifting “annual growth” to 2.5%. Prepare yourself to not hear any trumpeting of the fact that is still 30% below the Treasury’s very recently revised 3.25% “estimate” for 2011-12 … and now half the year is over. All the “growth” in July-September came from the mining states of WA (4.1%) and QLD (2.9%). The rest of the country is either in (SA, TAS, ACT), or near (NSW, VIC) recession. Make no mistake dear reader. Australia’s economy … and Wayne’s “surplus” … is hanging on China.